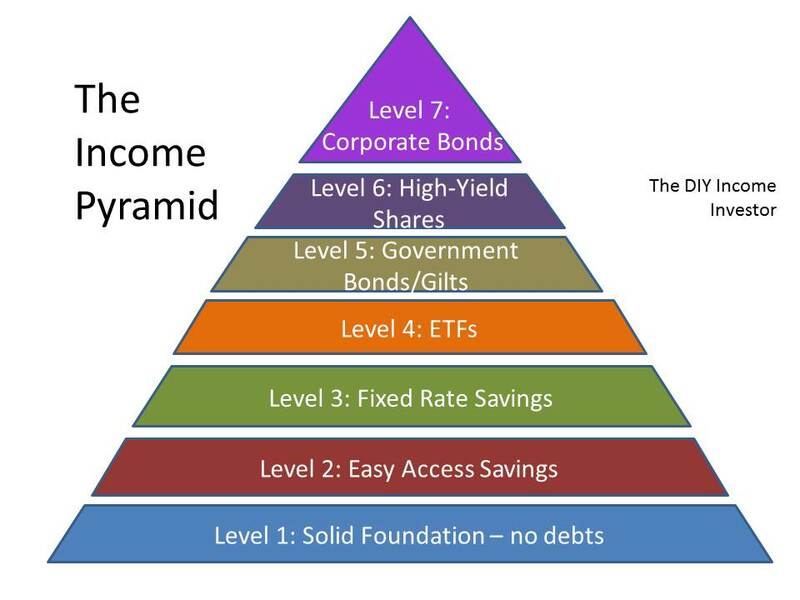 Developing the theme of the The DIY Income Investor, we continue building up your Income Pyramid by moving up to Level 3 - opening a fixed-rate savings account ('money market' account in the US). 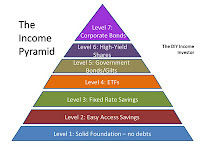 Level 1 was getting to the sound foundation of no debt and paying off your mortgage. Level 2 was setting up an 'Easy Access' bank current/checking account. Level 3 is all about fixed-rate accounts paying more than your basic current/checking account. These are called 'savings bonds' in the UK and money market accounts in the US. Don't forget that you should have built up an emergency fund of equivalent to 3-6 months' expenditure to cover any financial emergencies in your Level 2 savings - current/checking account and 'easy access' accounts. The fixed interest accounts will provide a home for your 'surplus' cash for a while - generating more income than is possible in your 'easy access' accounts. In practice, you would probably be able to get access to your money if there is a real problem - but at the loss of some or all of the interest built up. You tie up your money in return for a a higher rate of interest. But don't forget about tax - you need to think about minimising your exposure to tax. This means that you need to decide who will hold the account - if your spouse has a lower income tax rate, it would make more sense to keep the money in their name. Also, there may be a tax-shielded account (such as a Cash ISA in the UK) where you can hold your money (but be aware that you will want to use the larger Stocks & Shares ISA annual allowance for your other investments - in the higher levels of the Income Pyramid). Generally speaking, the longer you commit your money, the higher the rate of interest. However, economic conditions can change (for example, general interest rate may go up) - so think carefully about how long you want to tie your money up. It may be best to hold a couple of these fixed-rate cash accounts with different maturities, so give you a bit more flexibility in transferring money to other investments. Typically you will invest a lump sum, rather than 'drip feeding' your account - so this may lead to you picking up a couple of different accounts, as you accumulate a suitable lump sum. The available deals change all the time, so check out what is available as fully as you can each time you have a lump sum to invest. Some banks offer 'regular saver' accounts with an enhanced interest rate over a period - typically a year but usually with a limit on the amount that can be paid in each month. Nevertheless, they can be a good way of accumulating savings in the early stages of your investment strategy. At the end of the period, the money is usually paid into a standard savings account (with usually a pretty poor rate of interest) - this is when you should yank it a lump sum for a fixed-rate investment. For the UK, a good place to start checking MoneySavingExpert for is you can check out Regular Saver Accounts at Regular Saver Accounts (in early March 2011 rates up to 8% were available) and other Savings Accounts (e.g. 5% fixed for 3 years). Another comprehensive source is MoneySupermarket.com. Past favorites (I've rolled over my money a couple of times, shifting it between accounts) have included ICICI's HiSAVE Accounts and term bonds with BM Savings as well as Barnsley Building Society. You are not limited to these banks, obviously, and these may not now the market leaders, so shop around. See the Get Rich Slow blog introduction to money market accounts and their useful tool to identify a suitable US savings account.